A popular steakhouse in Whistler, Monk’s Grill is located next to the ski runs at Blackcomb Mountain, right in front of the Wizard Express chair lift. 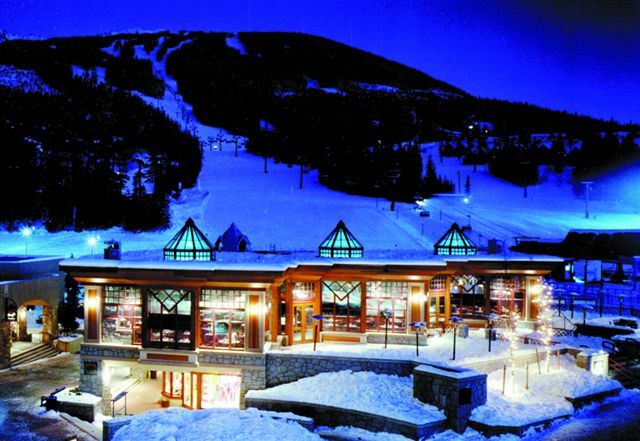 The restaurant has ski in / ski out access and is next door to the Fairmont Chateau Whistler. It is also within walking distance to the Four Seasons Resort & Spa in Whistler. During the summer, Monk’s Grill is in the centre of the Whistler “Summer Family zone” which includes activites such as: 18 hole Links mini putt, flying trapeze, farmer’s market & crafts fair, Kiss the Sky bungy, climbing wall, and horseback rides. plus an appetizer and a dessert for $35.00. I’m interested to make a trip out to Whistler in the coming months to give Monk’s a try. Feel free to leave comments below, regarding your experiences at Monk’s Grill in Whistler! Goldfish Pacific Kitchen (web site, map, 1118 Mainland Street, Vancouver, BC, Canada, phone: 604 689-8318) is an upscale restaurant in Vancouver’s downtown Yaletown neighborhood, that offers fine dining in a trendy, lively atmosphere. In a previous dinner time visit, I enjoyed their ling cod ($22). Since then I’ve been back three times for lunch. Goldfish offers daily lunch specials which are $10 plus tax and tip. These specials really showcase the talents of executive chef William Tse. Flat Iron Steak (on Thursdays) is served with mushrooms, snow pear, and mustard green salad. 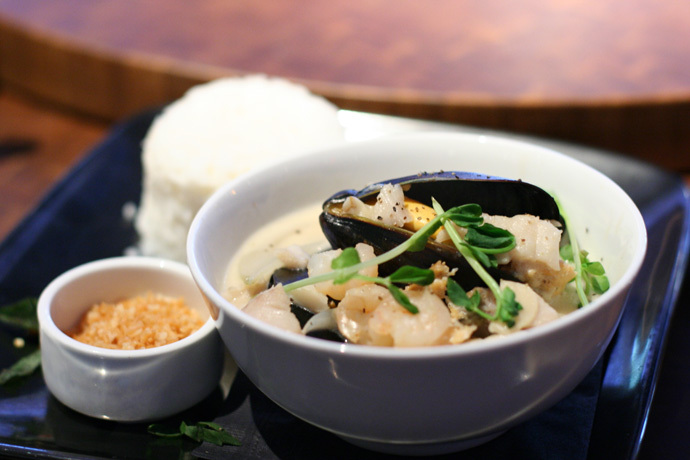 On Fridays, their special is the seafood fricassée (pictured below), with mussels, fresh fish, thai basil, coconut, and fresh chiles. The flavors in the fricassée were fantastic, expertly crafted into bringing out the freshness of the seafood, with a rich broth that went with the rice perfectly. The fresh chiles were extremely spicy but our helpful server warned us about them, and thankfully they were served on the side. Another popular lunch choice from our table was the Shanghai Noodles, which can be ordered with beef short rib or chicken. Many food fanatics (or “foodies” as they are affectionately known) love Vancouver because of the remarkable East-meets-West fusion that happens in the kitchens of our many talented, daring, and masterful chefs. As a port city we are fortunate to have some of the freshest ingredients arriving in our markets from Asia and the Pacific Northwest. Chefs like William Tse and restaurants like Goldfish are setting the stage for Vancouver as a world-class food city. Please visit the Gold fish restaurant’s web site if you’d like to browse their menu or see some photos of the room’s cool decor. Seafood Fricasse from Goldfish Pacific Kitchen restaurant in Yaletown, Vancouver, BC, Canada. 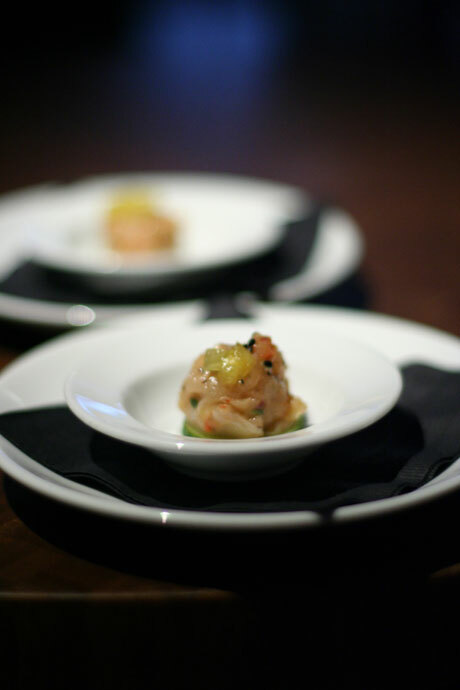 Amuse bouche, a little complimentary appetizer created by their chef. 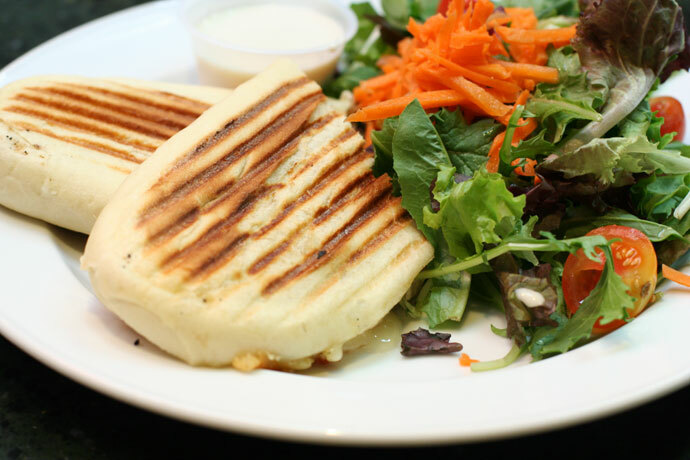 I made another visit to the Beatty Street Bar and Grill (map, 765 Beatty Street, Vancouver, BC, Canada, phone: 604-688-3504) and enjoyed their Parisian Panini sandwich ($11.99, pictured below). The sandwich was made with fresh brie cheese, fresh tomatoes, chicken breast, and tasted great! This is currently my favorite item on their menu. Instead of the side salad (pictured) you can also order it with fries. The Beatty Street Grill is located in the Georgian Court Hotel which is near BC Place Stadium and GM Place Stadium in downtown Vancouver. For more photos and info about this restaurant / sports bar please visit Part 2 or Part 1. View More Restaurants in the Olympics 2010 category. We hope you enjoy the great Olympics 2010 restaurants on Dine Out Here Vancouver.